Photo: South Texas Rattlesnake – Revealed! When I opened my email and saw this photo, my first thought was HOLY SH*T! Read the full story of the snake, here. This is the photo of the rattlesnake that “joined” my Mom and her friends for dinner at Snoopy’s Restaurant in Corpus Christi, Texas, recently. I love how it’s just his tail end, as if he’s making an escape, hiding his mug shot, but in reality, the snapshot leaves NO doubt that this was a diamondback rattlesnake! You’re guilty, buddy! When I moved to New York four years ago, I did feel like I left behind a vast wilderness. Texas may receive a lot of bad press (New Yorkers love to hate Texas), but in its more rural parts, it remains untamed in a scary-but-good way. What’s a dose of historic reality if not a rattlesnake joining you for dinner? For most residents and many visitors, Snoopy’s Restaurant on the Laguna Madre in Corpus Christi, Texas, is a must-visit. The seafood is fried fresh to order, and the sunset views from the outdoor tables are simply spectacular. While I certainly never saw a rattler at Snoopy’s, rattlesnakes on Padre Island are elusive but fairly common (or once were – like all fragile creatures, they are in decline). They hunt rabbits, birds, eggs (bird eggs, sea turtle eggs being too scarce these days) and little rodents. The only time I got face-to-face with Texas rattlesnakes, sadly, was here: Freer Rattlesnake Round Up. Yes. Horrified? Intruiged? Read more about rattlesnake roundups from the National Geographic. I’m so blessed to live a mere block from Socrates Sculpture Park. The photo opportunties abound. If you’ve ever wanted to visit, go. And yes, go on nights that they have events. Bring the kids, the dog, the picnic blanket, some cash for the unexpected goodies (weird food, lemonade), and the camera. And I still feel that way about all the currently named candidates — boring, boring, boring. But, if Bloomberg runs, he’s got my vote. He would be like a glass of iced tea on a sweltering day, or, better yet, a slap in the face to American politics (and apathetic voters like me). In other words, someone who rocks. My last post on the devolving real estate situation on 14th Street in Astoria got a ton of traffic. Which is great — perhaps with enough good luck (and blog links), someone in an important position will read my post, and begin to think more thoughtfully about how to keep Astoria a treasured, beautiful neighborhood. In spite of my disposition about so much of the available real estate, I think Astoria rocks. Why do I care? Aren’t I short-timer? Yes, but before I moved to Astoria, I lived in two neighborhoods in Manhattan. Sure, they had their charms. But I was never thrilled to be home after a long workday — “home” being the sights and smells of my neighborhood. Now, though, when I get off the bus or train, I’m happy. Astoria is solidly middle-class, smart and diverse. With the best (Greek, Thai, Czech, Hungarian, Italian) food ever. And big trees. 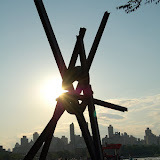 And the gem that is Socrates Sculpture Park. So if/when I move back, I want it to be the same smart, diverse and beautiful place I left. So, here’s a shout-out thank you to the Queens Crap blog, which gave me a shout-out earlier this week, leading to my post getting picked up in several more blogs. And I’ll keep the photo shows coming. I think it’s the photos of the crappy buildings that perhaps evoke the most thought. A jaunt down 14th Street south of Astoria Park is a reflection of the real estate development issues in Queens, and greater New York. How do you build new, cheap homes that house a lot of people but aren’t totally gross to look at? Note that, for some reason, the developer hasn’t yet torn down the Gothic steel gate, which includes an inscription from the early 1900s. Not only is this facade crammed with too many patios, doors and window air-conditioning units, it’s also got the typical Nuevo Queens Style of driveways replacing grassy front yards, with all trees being torn down in the process. It’s rather unsettling to walk by, especially when it’s so close to the Victorian home. It’s like watching the Blob digest the block. Full disclosure: I live in one of these new, ugly apartment units, not far from 14th Street. It wasn’t until I moved in and became more familiar (and in love with) Astoria that I realized what stood on the lot before they built the current building: a historic farmhouse. One more thing: Another terrible quirk of Astoria is all the damn power lines. Here, the view of the Triboro Bridge is obscured. I have a very fancy camera — a Nikon D50 — yet I rarely experiment with the manual functions. I used to know all the fancy tricks back in college, when I took a photojournalism class, and even had to process my own photos in a dark room. But, that was many years ago, and now I’m realizing that while my photos are good, they could be better. So, here’s one experiment. While sitting on my bed with my dog, I wanted to see the difference between using the flash, or not. The ruling: He’s damn cute either way.